Last evening I had a drink outside near the Eiffel Tower, at La terrasse, a restaurant at Place de l'Ecole Militaire. Not only were the waiters extraordinary nice, but on top of that the food was excellent. We had a little bit of everything, including foie gras of course, and... escargots (well "they" had escargots, of which I'm not a big fan!). I could not help but taking a photo. And if you're tempted... Here is a recipe. Those escargots look so delicious! Maybe I'll chop a clove of garlic with some parsley (I don't have butter) and pretend I am eating them. Butter and garlic! Who needs the snails? 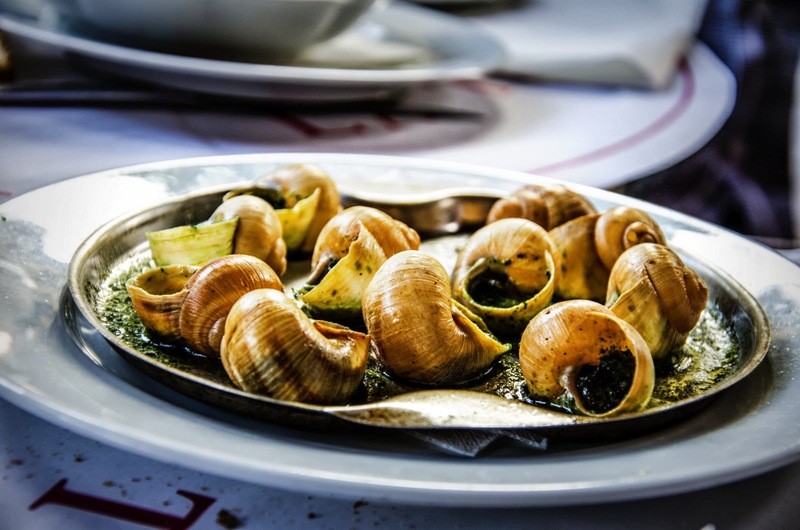 I've had snails a couple of times in Paris much to my wife's disgust, Very tasty. You need to remember to kiss her BEFORE the meals. She'll enjoy them more that way Drummond! I am not a fan either. I have tried escargots (twice!) and did not enjoy the sensation of eating snails! You found my favorite cafe!! They also have fabulous mussels! In fact, I've never ever had a bad meal there. When I lived in Spain, I collected a whole bucket of them and left them overnight to release any poisons. I forgot to put on a lid. The next morning they were all over the house, leaving behind a slimy residue! About foie gras, I think its production must be banned all over the world. Ah, food debates. Every culture has meals that other cultures find distasteful. About La Terasse, from yesterday's post. The first time I was in Paris I found myself there having a glass of wine after a very long day. I believe I had come from the top of le Tour Eiffel, which is an exhausting day right there, considering the long wait, the cattle herd of people, etc. I walked down the street to a phone booth (remember those?) and called Craig and Karen. It was their last night in Paris. I jumped on the Metro and we had dinner at that chain Leon de Bruxelles for mussels. Ok, ok, not Cordon Bleu, but it was fun. Ooooh, yummy!!! I love snails. Also very good at Le Grand Colbert. Snails are best left out in nature.